Goodbye Virginia blues! Since my last post, my trail (and river) experience has taken a turn for the better. The downtrodden feelings that were dominating my hike have more or less disappeared and I have been enjoying each day thoroughly. After taking a few days off with new friends in Troutville, I travelled up to Waynesboro with Ducky and Cha Cha. It was their last night before heading home to Massachusetts and we stayed in a hotel for the night. We went to the famous Ming’s Garden all you can eat buffet, which had delicious Chinese food as well as an endless supply of sushi. I’ve been trying to find good sushi on the trail since day one, so I was basically in heaven. After they left the next morning, I resupplied and stayed another night in Waynesboro at Stanimal’s hostel. I reconnected with a couple trail friends there and the next day it was back to the trail! Shenandoah National Park was different than any other section of trail thus far. The terrain was comparatively easy, with few rocks and roots in addition to gradual inclines and declines with flat areas interspersed throughout. I enjoyed that. 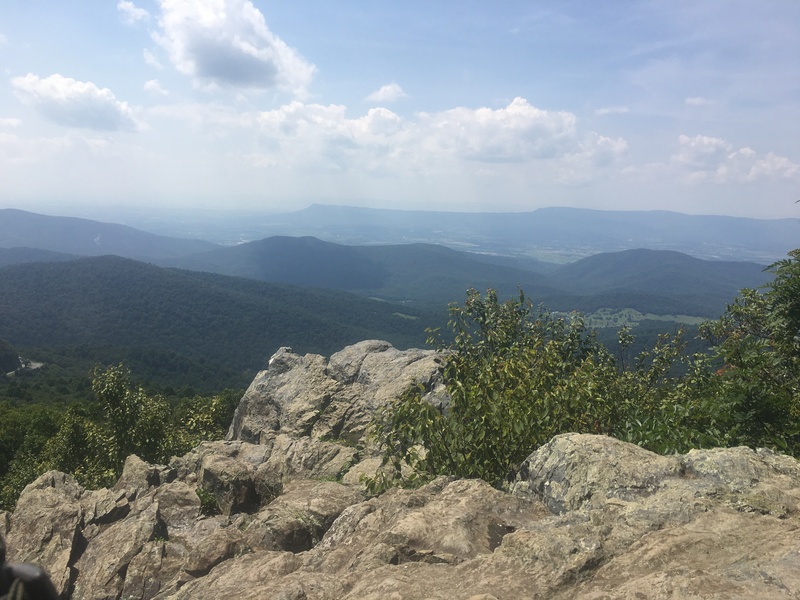 The trail intersected the main scenic road, Skyline Drive, several times per day. There were waysides and camp stores available to stop at every day, which included dine-in restaurants, snacks, and cold beer. The food was delicious and the popular blackberry milkshakes were a welcome treat after putting in miles in 90+ degree weather. There were also several exquisite lookout points throughout the park and although it never felt remote due to the proximity of the road and being a heavily trafficked tourist location, the hiking was a ton of fun. After a few days on trail, I managed to hitch into Lurray and stayed the night at a wonderful hostel called “Open Arms at the Edge of Town”. Allison, the proprietor and all around awesome host, gave me a ride to Shenandoah River Outfitters the next morning so that I could begin the next part of my journey. Aquablazing! The outfitter shuttled me to the start of the river where I would begin a 45 mile kayaking trip from Lurray to Front Royal. I paddled down the river for 3 days and 2 nights. The Shenandoah River is very wide and teeming with canoers, kayakers, tubers, fisherman, and campers swimming in the water by their sites. And it’s not hard to see why. The river is stunningly beautiful, surrounded by woodlands and mountains visible in the distance at many points. While I was out there, the sun was shining constantly and although it was almost 100 degrees outside, the occasional splash of water from mild whitewater rapids was adequately refreshing. I would guess that the river flowed at around 2 to 3 miles per hour at most points but some areas were significantly faster or slower. The depth varied regularly, quickly going from deep enough where you couldn’t see the river bottom to floating over underwater ledges on which the kayak would get stuck. Some areas of water were clear so that looking downwards, you could see various fish, plant life, and rock formations. I also saw herrings perched on boulders protruding from the water and loads of turtles basking in the sun on logs and rocks. 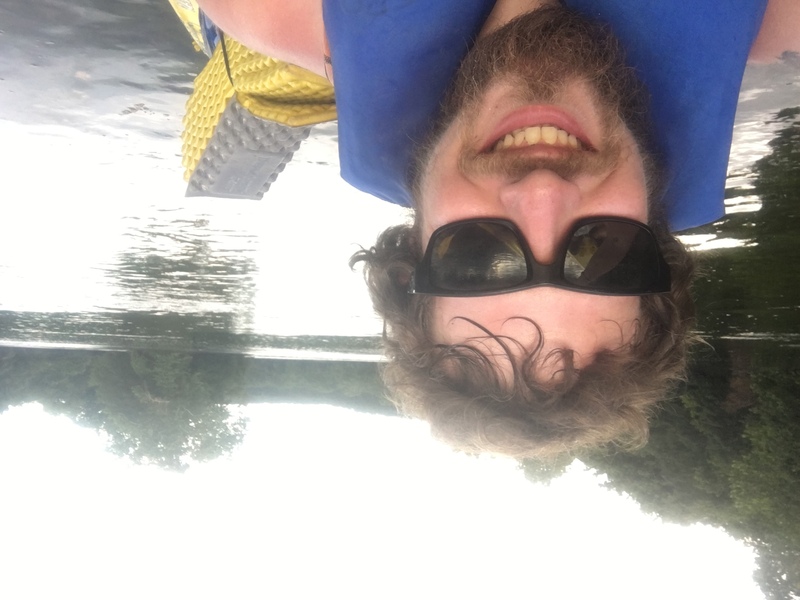 I had a blast while I was on the river. It was wonderful to see so many other people out there having a great time. Feelings of nostalgia arose in me while watching families spend time together, laughing and seemingly carefree. I was reminded of the camping trips my family used to go on when I was a kid, which provided me with some of my favorite memories. At one point, a few canoers were on the shore where I took a break and showed me a couple of baby water moccasins that they just killed. Apparently these snakes can be highly venomous so I walked up to the closest campsite to warn a family that had kids roaming around the area. They invited me to hang out for a bit and offered me food and a beer while we engaged in entertaining conversation. Everyone seemed to be having a good time. There was a positive energy that pervaded the atmosphere on the river and this helped make kayaking one of the highlights of my adventure. I stayed in a campsite the first night, which was loud but alright. The second night, however, I found a small and secluded beach on the side of the river. I had it all to myself. After setting up camp, I enjoyed a serene night listening to the sounds of nature and watching the stars. It was all wonderful and provided time for reflecting on my journey. But I’ll save those thoughts for my next post. If you’re going to paddle the South Fork, I would suggest doing it between May and July 4th. The river after July 4th drops, and MANY Outfitters wouldn’t suggest it because you will be pulling your canoe over rocks. This July was lucky, we got a lot of rain, etc…. The section you did, many Outfitters operate that section. They’re the following: Front Royal Canoe, Downriver and Shenandoah River Outfitters. Skyline Canoe goes from Front Royal, VA to Harpers Ferry, WV (before it). Front Royal Canoe will go from Waynesboro, VA to Front Royal, VA as long you have 6 canoes (12 people). Requires a lot of planning and logistics. P.S. I’m 99.9% sure those weren’t water moccasins… We don’t have them on the Shenandoah River, the ONLY place you will find water moccasins are Virginia Beach area. The snakes are most likely common water snakes (Nerodia sipedon) which are harmless to humans.